Don’t you just love night time photography? Well, I do. An ordinary street scene takes on a different mood. Something prosaic takes on a kind of magic. Technically, of course, there are many issues. Cameras are not well geared for shooting in this level of light. Ideally, one would have a tripod to hand. This was shot without one. But then, on the other hand, something about night shots leads us to expect and accept lower technical quality, or some kinds of it: we still would not find motion blur acceptable, unless it was from the movement of a car’s tail light, for example. It’s as though the graininess becomes a welcome addition, like visible brush strokes in a painting. The imperfections are all part of the photograph’s charm. This was shot at ISO 400, f2.8 and 1/10th of a second. At this distance in time – I took this shot 6 months ago – I cannot account for the lack of blur. At 1/10th, without a tripod, it should be a given. I can only assume that I jammed the camera tightly onto a piece of street furniture – a technique I often use in these circumstances - I or got very lucky. The photograph was taken on a little a compact camera: a decent quality one in its day, but an old one now, but still, a very handy thing to keep in one’s pocket, in order not to miss anything that might be worth a shot. So I am even more pleased to see that such a dinky camera produced such a charming result. There is still great tonal depth, sharpness, clarity and a sense of space. 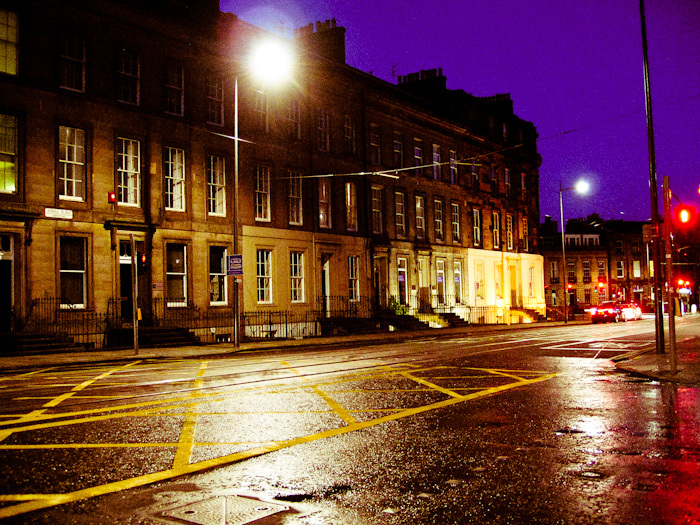 The location is Atholl Place in Edinburgh. This is one of many photographs taken on a trip to the great city, earlier this year, and a reflection of my endless interest in photographing architecture and the street. There is not much in this shot, but I enjoy the way the scene is so different from the day; the transforming effects of the shift from natural light to the yellow of sodium street lights; the way the lights overwhelm the camera's sensor and become abstract, glowing orbs; and the reflective wet surface of the road. Atholl Place, Edinburgh. Night Photography Somerset.